I enjoy painting multi-colored ears of Indian corn. The variety of colors they come in is amazing. I thought for some time how I might use these in a large format painting. I had a photo of white washed beams in an old barn at a local winery, and had worked out a way to incorporate these and the corn into a painting. The 6 X 8 inch pencil and water color sketch below was used as a starting point. 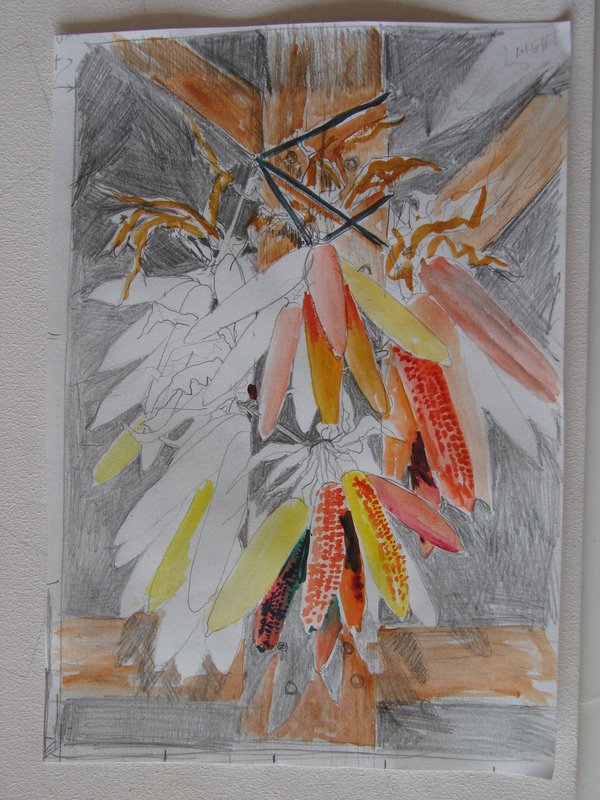 I followed this up with a full-size drawing laying out four groups of corn and husks tied to the post. I had an 18 X 32 inch gold frame on hand. I cut a sheet of 1/8th inch Masonite to an 18 X 32 inch panel. Using a three inch short-nap roller, I applied three coats of gesso to the face of the panel, letting each coat dry overnight. I sandpapered each coat lightly before applying the next coat. This produced a texture with thousands of tiny peaks and depressions that I prefer to paint on. I applied two coats of gesso to the back of the panel to reduce warping. 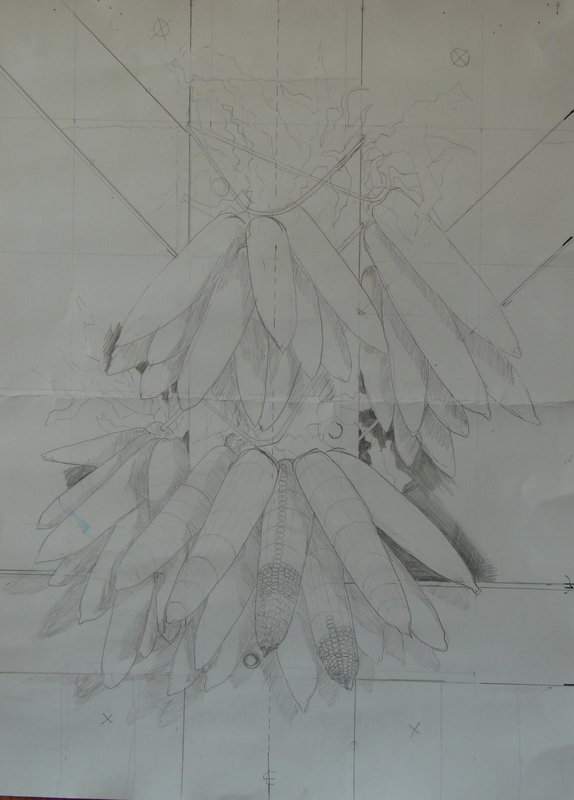 I placed tracing paper over the drawing and traced the major components. I make my own carbon paper by covering a small piece of tracing paper (about 6 X 8 inches) completely using a #2 pencil. Don’t use regular carbon paper. This will bleed through the acrylic washes of paint. Tape the tracing paper on the blank white panel. Slip the “carbon paper” under this. Draw the major components with a stylus such as a worn out ball point pen to transfer the sketch to the panel. Apply only enough pressure to transfer a light line to the panel. Check your progress often. It is a reminder of how I developed the colors to get to the finish work. I use it as a teaching aid in my art classes. I occasionally post these painting processes on this web site for others to enjoy. I use these for painting demonstrations and art shows. I also provide the person purchasing my art all of the sketches, color maps and progress photographs when they pick up the finished painting. Use a three-inch short-nap roller to apply three coats of gesso to the face of the Masonite panel and let each coat dry overnight. Sandpapered each coat lightly before applying the next coat. Applied two coats of gesso to the back of the panel to reduce warping. Make your own carbon paper by covering a small piece of tracing paper (about 6 X 8 inches) completely using a #2 pencil. Placed “carbon paper” under the tracing paper drawing. Draw the major components with a stylus such as a worn out ball point pen, applying only enough pressure to transfer a light line to the panel. 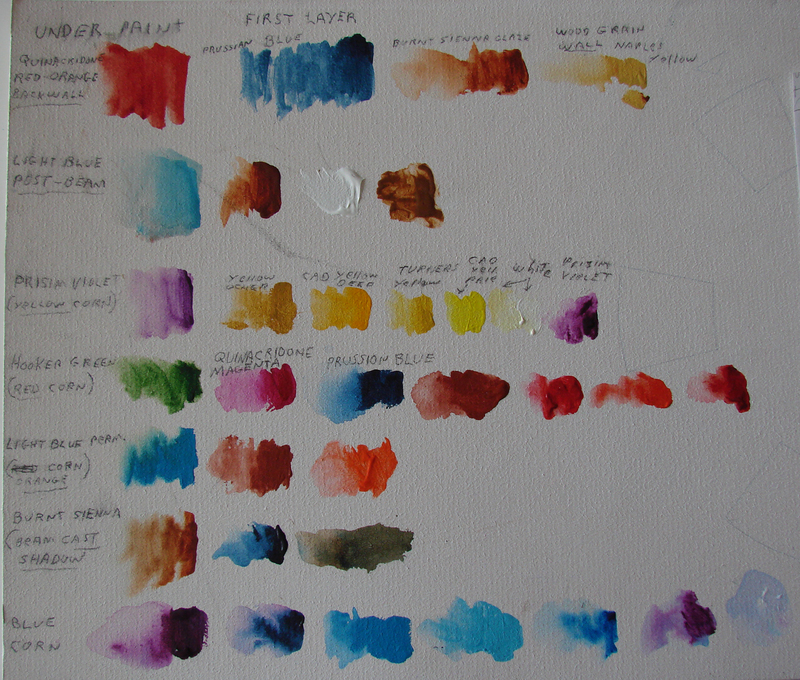 Kept a record of the colors you uses during the development of the painting. A small daub of paint pulled into a wash works well. Note the name of each color. In the second lesson, I’ll show how I start the under painting with a series of complementary colors and build up the painted surface and textures using several methods to apply the paint. Look for this the week of April 28th. This entry was posted in Uncategorized and tagged painting process, painting tools. Bookmark the permalink.